I should explain, I went into this review with some trepidation. The reason for this is that I really liked the previous incarnation of VW’s small SUV. It was great, well specced, reasonably priced and drives really well. Plus it was only on sale for about 18 months before VW decided it was time for a change. When I say I liked the old model… to be perfectly clear, it’s what I drive. That’s how much I liked it! So what’s changed? Quite a bit actually, which only fuelled my concern. as well as some exterior differences in terms of the overall shape – minor tweaks – and some styling additions, which I like, they’ve changed the trim levels. This is one of the issues I have. My particular VW is a Tiguan Match, which gives it keyless entry and exit, a push button start and reversing sensors. The equivalent level in the new line up is the SE Nav – the one I tested. It’s a couple of thousand pounds more expensive than the Match level I have, and for that you get… well, slightly less in some areas, slightly more in others. The main difference is the keyless entry and start button… which sounds pedantic, but once you get used to that, actually turning a key feels somehow old fashioned! It gains a couple of features too, so on the equipment level I guess it’s fairly even, but personally I’d prefer to have kept the keyless entry and go. There’s one other main difference to the dashboard, and to me, this is a real annoyance. The navigation screen which, while still very functional and effective, has been moved maybe 3 inches down the centre console. I know how silly that sounds, but it takes it out of your eye line and at speed, that extra half second to glance further down to check your heading means that at 60mph you’d travel an extra 13 metres – a little longer than a double decker bus. Okay, I’m sure the health and safety boffins have worked out that it’s all fine and safe – this is a VW we’re talking about after all, so I’ll forgive them this movement. The real differences are the styling and the engine. The engine kicks out the same power as the previous incarnation, and is ever so slightly more economical so no complaints there, but somehow it does that while being quieter. Significantly quieter. But the great stereo system means you won’t be listening to the wind. It’s not exactly a Bose system, but it’s really decent, especially given the fact that this is to all intents and purposes a family car. Oh, speaking of family… somehow they’ve managed to make the boot bigger, without noticeably making the rest of the car bigger. And it was actually a pretty good boot already, so that’s a plus too. Back to the styling changes. I couldn’t put my finger on what they’ve done – exactly what’s different, but I know one thing. I like it. Really like it. Yes, I’m annoyed that they’ve got rid of the keyless entry and start button, yes the sat nav screen is slightly in the wrong position, but as flaws go, they’re pretty innocuous. Getting to the important bit… how it drives. In a word – fantastic. It’s really easy to drive – a great gearbox, slightly lacking in torque at low speeds, to be fair, but it’s easy enough to get used to that. The really great thing is that, simple as it is to drive (good when you have two kids arguing in the back) it’s also responsive and fun to drive when you’re on your own. It handles really well – especially given its height – there’s no body roll, and it handles twists and turns impressively capably. 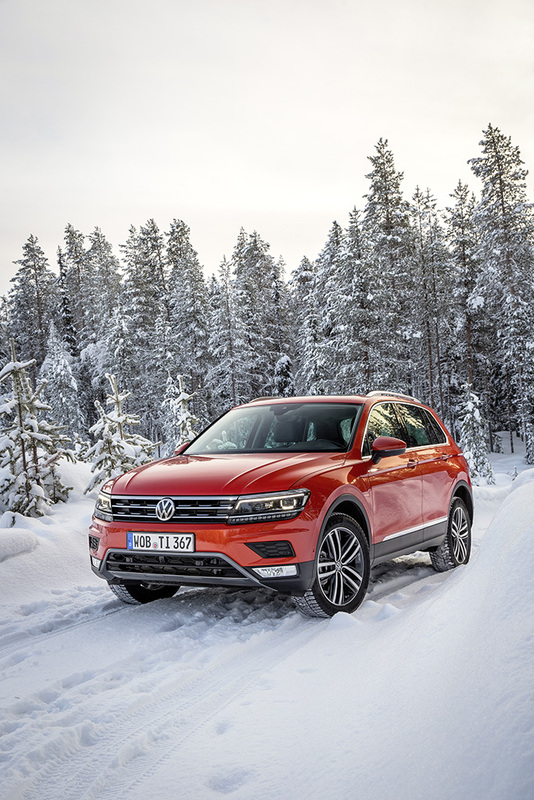 When it’s time to change my car, I think the new Tiguan will definitely be on the list. With any luck they may have revised the trim levels again by then as well.